If you like some texture in your food, this one is for you. 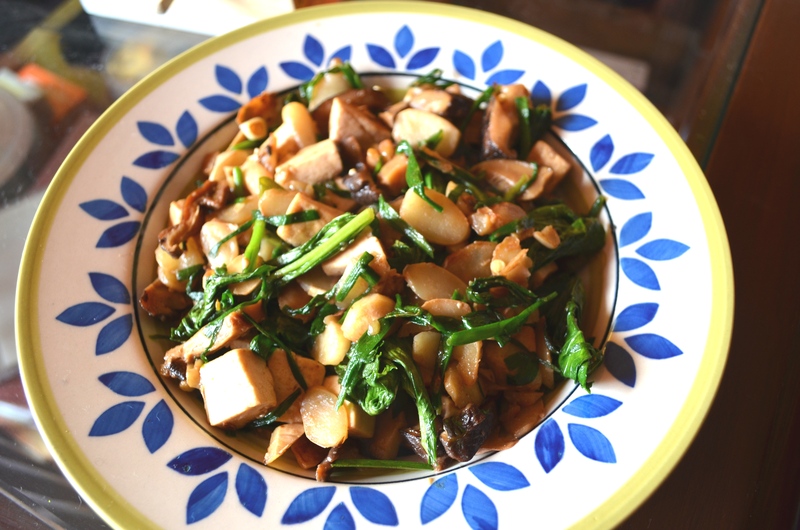 Crunchy water chestnuts that yield a little after getting cooked, creamy yet firm tofu and wilted greens are brought together by garlic and oyster sauce to create a burst of flavours and textures in your mouth. Reason why I absolutely love stir-fries. The usual story behind most stir-fries is laziness wrapped in health-consciousness. In this case, some effort was required in peeling the chestnuts so if you are truly lazy, think twice. If its any comfort, the rest of the job is pretty quick and dirty. Heat oil in a wok/kadhai. Add the chopped garlic – saute till it releases aroma. Add the water chestnuts, tofu, chinese greens, green chilly – in this same order, sauteeing for a minute between adding each ingredient. Drizzle the oyster sauce, quickly mix it up and turn off the heat. Serve it with plain white rice or sticky rice. P.S. I won’t tire of saying this. Please use Korean/Chinese sesame oil only. If you don’t have access to these, just use whatever neutral tasting oil you use at home but do not try to replace it with Indian sesame oil, that would be disastrous.